This takes practically no time to make and compliments most proteins extremely well as a side (depending on the preparation of the protein of course). I recommend eating it hot, however, I happened to take a bite of it again the following day right out of the refrigerator and it is even delicious chilled! Perfect to have on one of those hot summer days that will be upon us NYers very soon. Julienne slice the tops of the leaves off of the bok choy. Then cut the bok choy in half down the center. Cut the stalks in half diagonally. Because this vegetable can be quite sandy at times, after slicing it I soak it by completely submerging it in cold water. Strain the bok choy allowing all of the water to drain or speed up the process by pat drying it with a paper towel. Coat a large non-stick stir fry pan with the sesame oil. 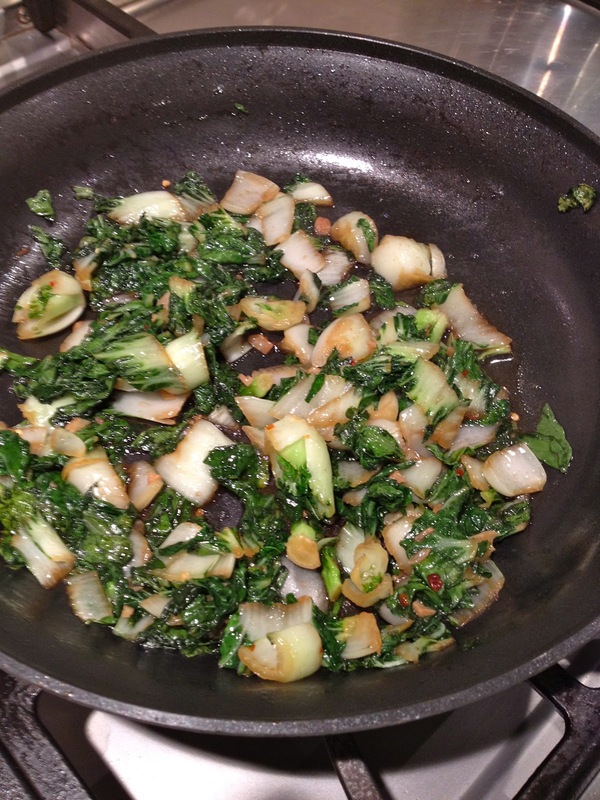 Add the chopped garlic, minced ginger and place the pan on a medium heat. As the garlic and ginger is browning, add the honey, soy sauce and crushed red pepper flakes (optional). Once the garlic is lightly browned add the baby bok choy, raise heat slightly and stir fry for two minutes (make sure you don't over cook the bok choy, this vegetable has such a great texture served slightly al dente). Serve. As a cold dish, spread bok choy on a cookie sheet and chill in the refrigerator for at least two hours. Serve.